Hello, and welcome to day 4 of the Papertrey Ink countdown and the Design Team group post. This time around Nichole has asked us to create both a small-scale and large scale banner project incorporating all the new banner products. I, along with some of you, have been waiting for a banner set up like this! Banner Builder and it's amazing line-up of coordinating dies, is more than I could have ever dreamed up myself. Now that it's finally here, I've been able to create a project that I've been dreaming up ever since inspiration struck me at the last baby shower I had gone to. My friend, and expecting mother, pulled a gorgeous light pink and navy blanket out of one of the gift bags and I was in awe. The blanket had a white background with a navy toile pattern all over it, with a light pink solid border. I immediately wrote the color combo down onto the nearest napkin, along with a couple of design ideas. I couldn't wait to play! Anyways, here is what came of it... For this banner card, I started with a white card base (measuring 3 3/4" X 5 1/2") and attached Shimmer White die cut clouds (I'm telling ya, I'm hooked on this shimmer cardstock stuff!). Die cut, stamped (in Sweet Blush) and pierced two holes at the top of each banner flag. Strung the banners onto Enchanted Evening baker's twine, arranged and attached to the card base (with dimensional adhesive), over the clouds. Tied a single bow from the twine and attached it with a dot of glue. Finished it off with a sentiment from Up, Up & Away stamped in Enchanted Evening. Here is a coordinating festive baby banner. This idea would be great for a baby shower or even as a gift for new parents to proudly display in their babies new home. 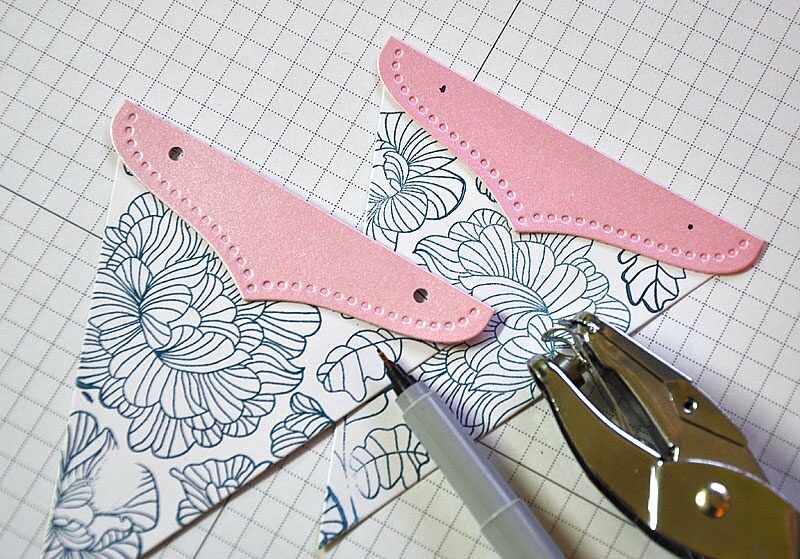 Anyways, being inspired by the new In Bloom dies, I pulled out my In Bloom stamp set for this project. 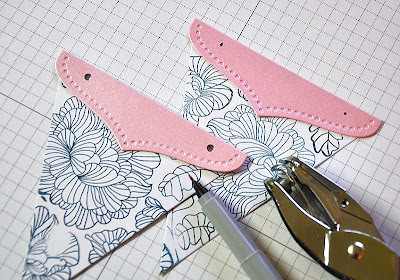 Stamped the blooms and leaves, in Enchanted Evening, onto white die cut basic banner flags and topped each one with a die cut Pink Shimmer banner border top. Punched two holes at the top and attached a letter circle to each of the banner flags. For the letter circles, I stamped each circle with a letter from Outlines Alphabet in Enchanted Evening and then filled it in using a navy Copic marker. To form the banner, I strung white silk ribbon through the holes of each flag and then embellished each with two Sweet Blush buttons. Here's A Tip that I found helpful when recreating the banner flags. For perfectly placed and punched holes: Punch holes into the first banner flag and use these holes as a template to mark hole placement on all other flags. fabulous projects. LOVE your banner card! So sweet Maile...you are so trendy and amazing. Wow...love the banner card and the large baby banner! So beautiful. I really love the shiny clouds, and how fun and elegant the card is. Thanks for sharing. Awesome projects. My fav is the card with the clouds and banner. I like the soft colors !! Love both projects, but especially the banner. The silk ribbon is so beautiful with the stamped flags. Too cute, Maile! I love it all!! oh my, I love how you put stamped the flowers in the background for the banners. so pretty and professional! wow! your creations are beautiful! loooove that cloud/banner card-gorgeous! Oh Maile, what a darling banner! 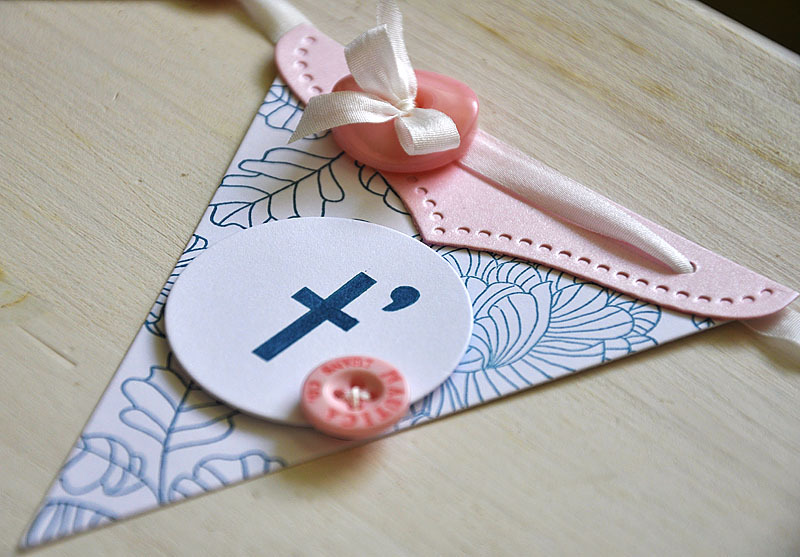 LOVE, love, love the card banners and the twine attaching them with the sweet little bow!!! You always inspire!! Love your sweet card and banner!! Beautiful! I love the white base with the shimmer clouds! Just darling! Your card is stunning! I plan to try it as soon as I can. wow, maile!!! your card and banner are STUNNING!! love that you can make them so simple yet so BEAUTIFUL!! Maile, your Banner flags are sooo beautiful! 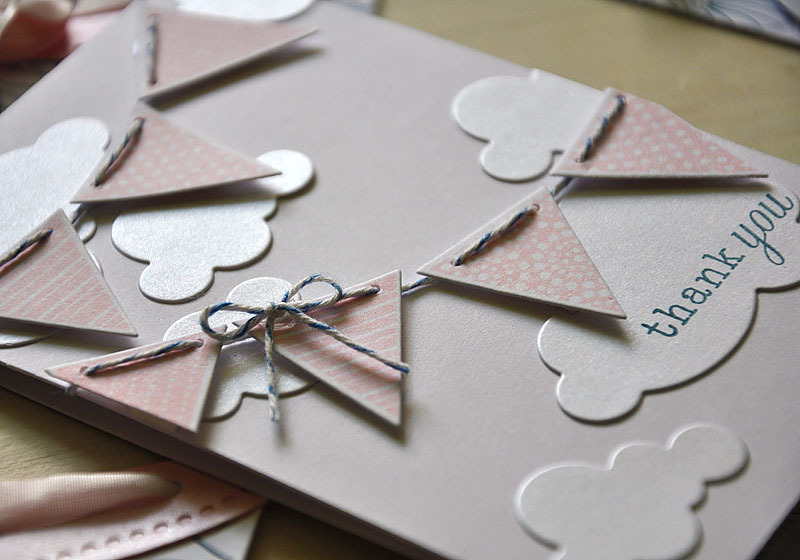 I have not seen the Shimmer card stock before and the borders in the Pink Shimmer are stunning (as are the clouds in your card.) Love the entire Banner idea for a Baby Shower. Very creative. OMG! Can someone faint from seeing so much cuteness? I LOVE your card and banner!! I think this card is my fav of all! You have an amazing style! Simply gorgeous projects, Maile!! I love the shimmer clouds, too! I wasn't planning on buying into this banner thing until now! The possibilities!! your projects are simply perfect! so, so adorable! The banner on your card looks like it's blowing in the breeze! Oh My goodness...what can I say that others haven't said already?! I'm blown away, Maile. 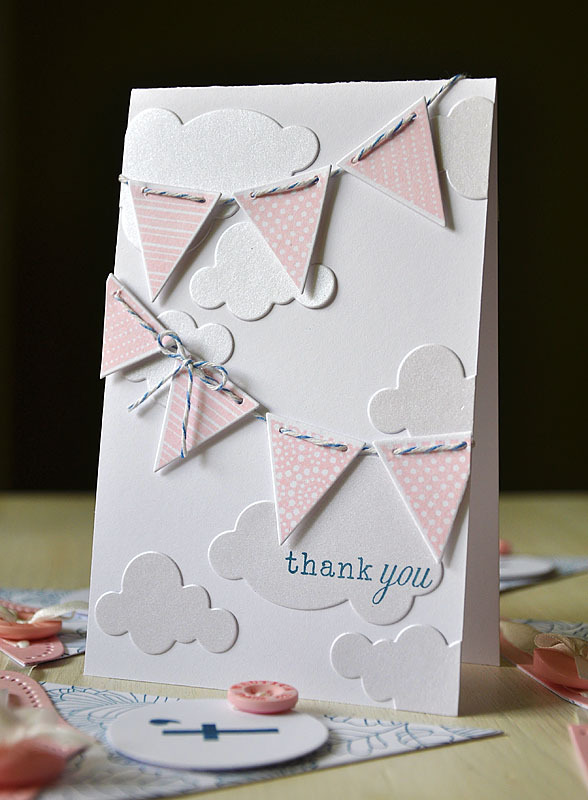 I love the cloud and banner card and using the in bloom stamps on the stringed banner is just genius! Beautiful banner! I love the color combo. Very pretty. So adorable! You have done a wonderful job putting the new collection to use. Fantastic! This is super cute, Maile!! LOVE LOVE LOVE it!! Adorable projects!! That color combo IS fantastic!!! Can't wait 'til my banner set comes in the snail mail!!! YAY!